Reading a story "The Gingerbread Man" with children. Made on the baise of Usborne STORIES FOR LITTLE CHILDREN. All the tasks are devided into: before, while and after reading. The first part represents matching animals with the sounds that they produce. P.S. before using this worksheet compare it with your story "The Gingerbread Man", there can be some differences. 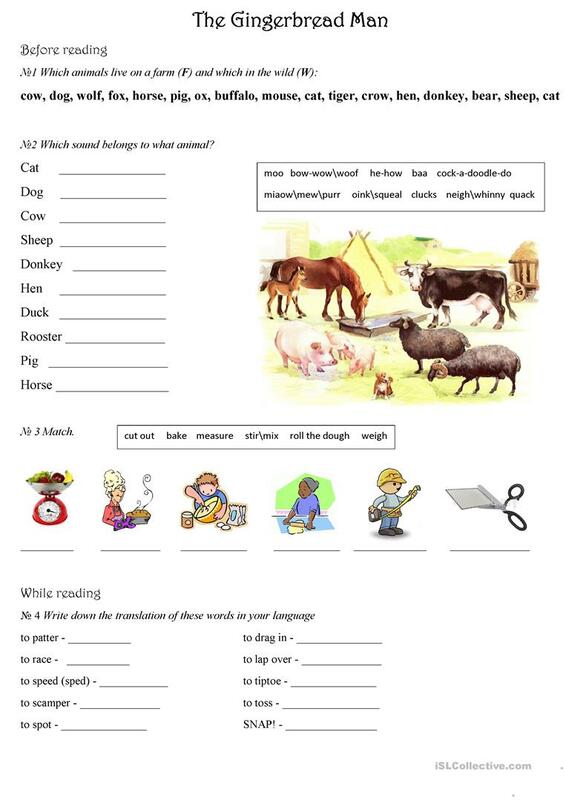 The present downloadable worksheet was created for elementary school students and kindergartners and nursery school students at Beginner (pre-A1), Elementary (A1) and Pre-intermediate (A2) level. It is valuable for consolidating Present simple tense in English, and can be used for enhancing your class' Spelling, Speaking, Reading and Writing skills. It is focused on the theme of Animals. It includes the answer key, too.